To be great, a piece of art must have deepening layers of meaning -- Velazquez imbued a portrait of royal figures with hints as to the illusory nature of life, while Manet's Olympia was an homage to both Titian's Venus of Urbino and how mad hot naked chicks are. Booya, Manet, booya. For modern wall decor that says a lot: Scott Lefavor Art From the art-oozing streets of Denver, Lef's a printmaker/ painter/ graphic designer pumping out limited runs of striking cartoonish prints & posters inspired by contemporary street art as well as "personal experience and current socio-economic trends", which in the case of artists is usually "poor". First up's a 50s-ad-aping tri-colored sketch series tackling social issues from healthcare (a pair of mummies sitting in an ER waiting room), to the economy (a comedy-masked dude at a bar saying "Pour Me Another Cause I Can Still See The Floor..."), to employment: a suit-wearing, luggage wielding guy next to the phrase "F**k this, I'm outa here", though who wants to keep anyone around who can't spell "outta"? 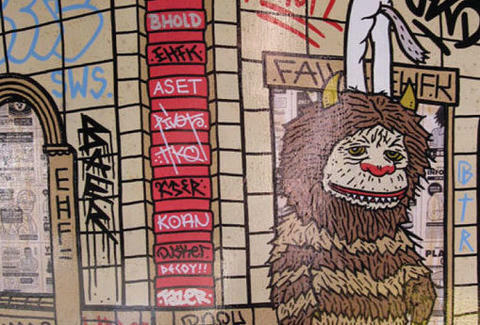 More opaque are super colorful, oft-pop-culture-referencing works like "Where The Wild Things Paint! ", with Max perched atop a furry friend spray painting his name on a heavily tagged building; a frenzied pop-art collage centered around a two-faced woman holding a working man in her hands, titled "Watch out boy, she'll chew you up! 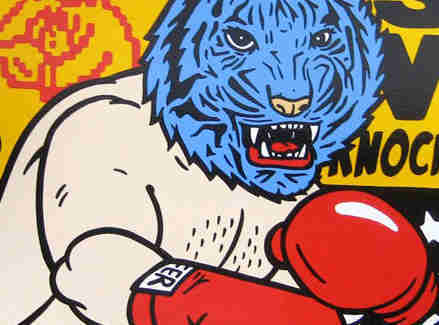 "; and a boxer whose face is that of a snarling tiger (though if you time pressing "up" right he's actually kind of easy to knock out). For those who brain-tire easily, there's even a trio of 12"x12" panels desecrating popular Disney characters, including "Rasta Donald Duck" hitting a binger, and a horny Bambi asking a doe "Fawn a f**k? ", though if you think that's mad hot, you probably have more in common with Manet than you think: syphilis.